The presence of a large underdensity, the dipole repeller, is predicted based on a study of the velocity field of our Local Group of galaxies. The combined effects of this super-void and the Shapley concentration control the local cosmic flow. Figure 1: A face-on view of a slice 6,000 km s−1 thick, normal to the direction of the pointing vector rˆ=(0.604,0.720,−0.342). Three different elements of the flow are presented: mapping of the velocity field is shown by means of streamlines (seeded randomly in the slice); red and grey surfaces present the knots and filaments of the V-web, respectively; and equi-gravitational potential (ϕ) surfaces are shown in green and yellow. 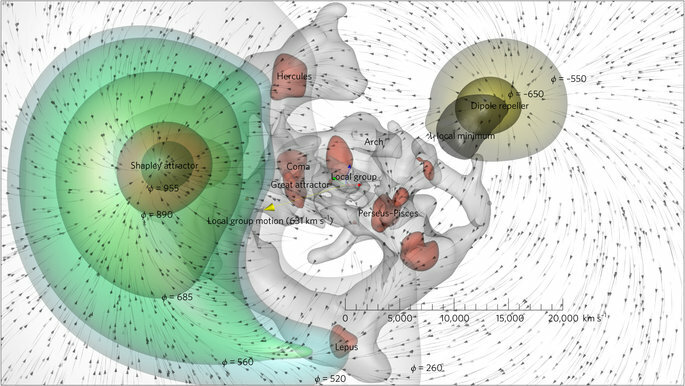 The potential surfaces enclose the dipole repeller (in yellow) and the Shapley attractor (in green) that dominate the flow. The yellow arrow originates at our position and indicates the direction of the CMB dipole (galactic longitude l = 276°, galactic latitude b = 30°). The distance scale is given in units of km s−1. Figure 2: A 3D view of the velocity field.